Who knows if we can really put into words what it means to be home. Some feelings are difficult to articulate and one such feeling is being home. To have a home for oneself is a dream common to all. And what would be more fun than to help someone realize this dream, and with such vision we worked with Mr. Himanshu and his family to get them that dream home worth aspiring for. We helped this wonderful family of 3 to transform their haven into a heaven. 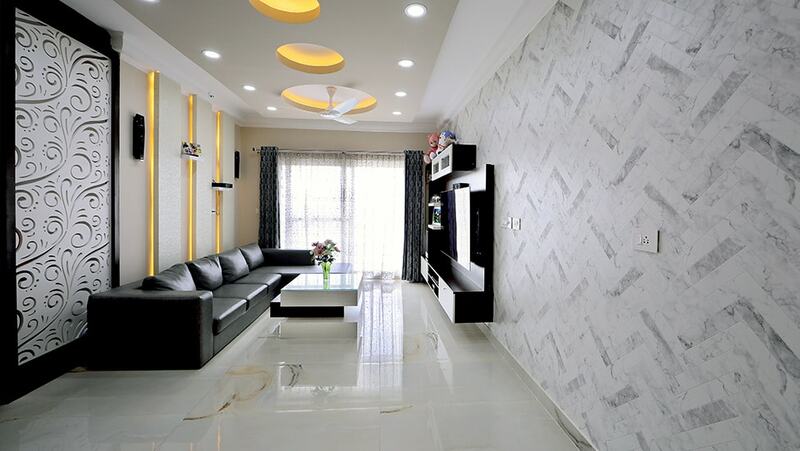 When Himanshu and his family visited Decorpot, they were clear about one thing. They didn't want anything that looked ordinary and as suggested, our designers provided them with combinations and designs that looked quite out-of-the-box. The house has a lot of ventilation plus the open design allows abundance of natural light to fall in. Keeping this in mind, the colour scheme provided in all the rooms have a base of white, thus helping the space look much bigger. 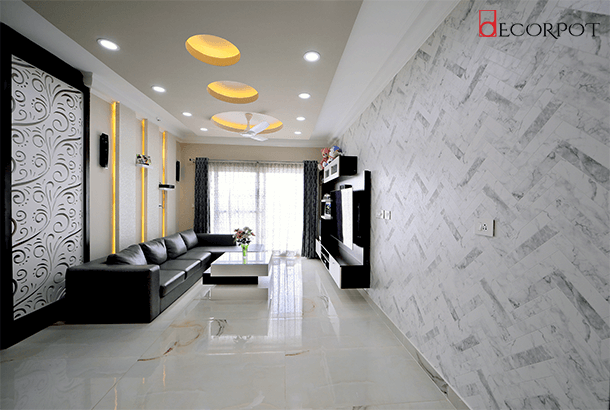 The living room has circular patterned design in the false ceiling that is flanked with cove lights. Also, the projections made on the parallel walls is backlit with cove lights, thus creating a seemingly smooth view. The white and dark wood finished laminates for the TV unit panels have arrays of open and closed units having lights within, thus giving a very modern touch to the entire setup. 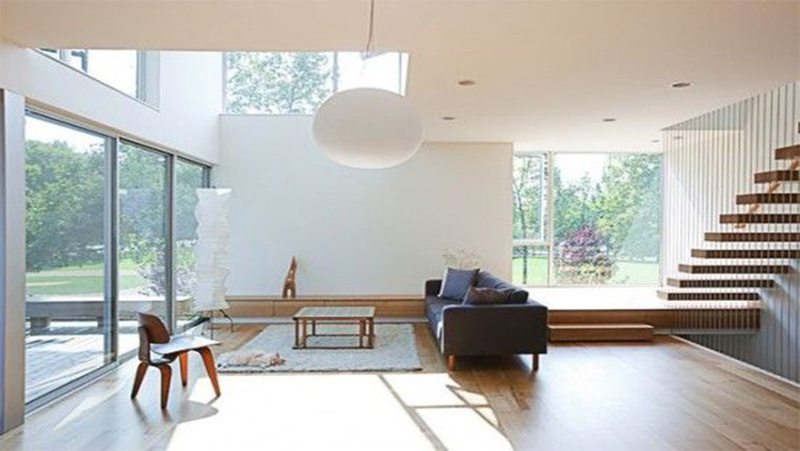 Also, the natural light adds up to the beauty of the space. A place to huddle up for those little yet random family gossips. This is exactly what Mr. Himanshu’s family had in mind during the dining area design phase and was delivered to the point by our designer. 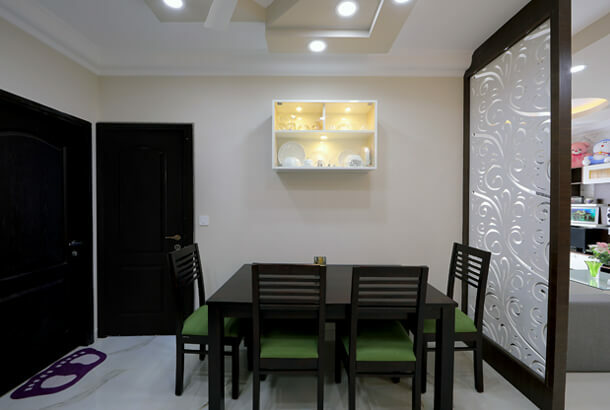 Keeping in mind the utilitarian concerns of the family, the living space was divided using a Jali partition to house a 4 seater dining setup, and with an added wall mounted crockery unit, the space became complete. 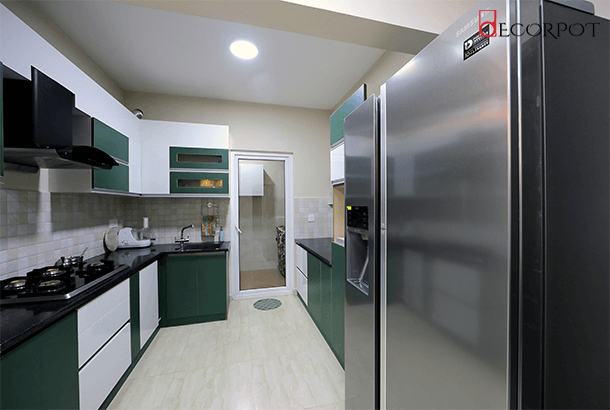 The color combination used in the kitchen is quite rare when you look at the Green and white combination. The space planning of this kitchen has been carefully done to see that there is zero waste of space, while fitting in the required elements. The master bedroom has been designed with dark and light colours, which blends well with the similar coloured furniture and wardrobes. 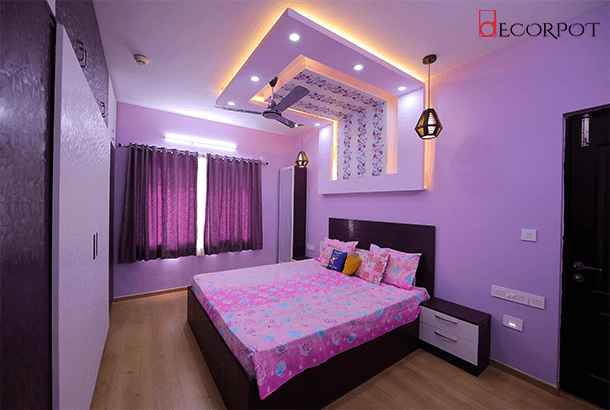 The textured 2 level false ceiling with the cove lights makes the design capable of creating a restful atmosphere that works really well for a bedroom and at the same time, adds a lot of class to the overall look & feel of the space. 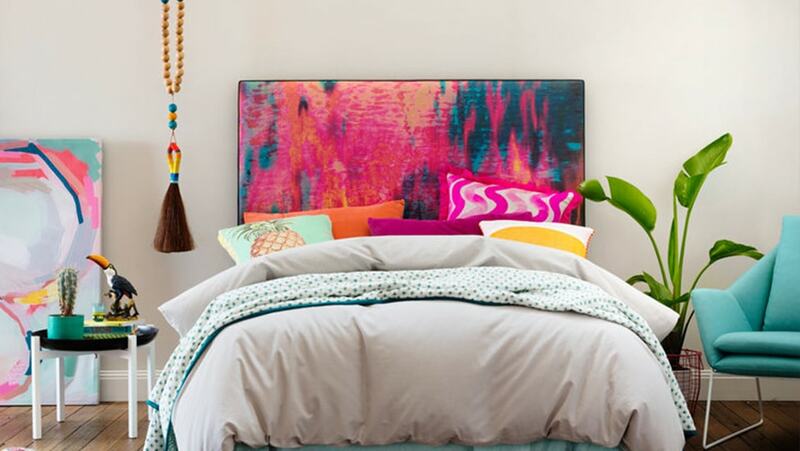 “We are really happy with Decorpot. The work done by each team was remarkable. 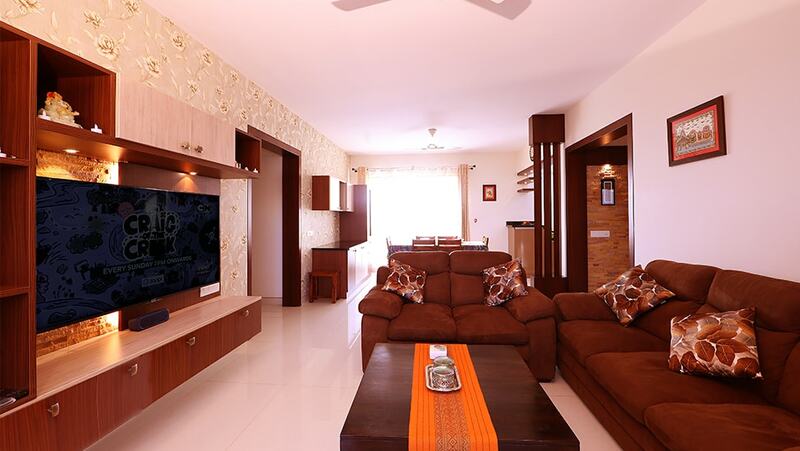 The execution was done so well and our home was delivered on time.” says Mr. Himanshu.